I hope you all enjoyed your long, extended holiday weekend! We spent ours between NC and TN visiting family, getting some lake time and stuffing our faces every chance in between. It feels like Summer is approaching quickly and I'm loving every minute of it! The weather has been beautiful which means more cookouts, backyard meals and get togethers. In lui of such parties, Kristal from The Strong Family and I have brought you two, simple and delicious desserts that are guaranteed to please everyone's taste-buds! Make sure to pin them! Kristal brought you heavenly Strawberry Short Cake! YUM! 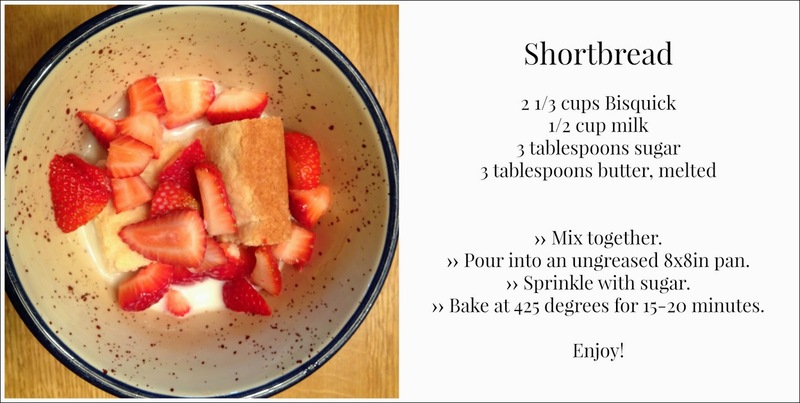 Strawberry Short Cake is one of my very favorite Summer time desserts. To me, it screams Summer. Fresh strawberries, light shortbread and milk. Wait, milk?! Yes, I put milk on my strawberries and short cake instead of Cool Whip. This was a shock to Robert and nearly a deal breaker. (Kidding on the deal breaker part!) I do put milk on it and because of that, I have no trouble substituting strawberry short cake for lunch or dinner. I mean really, how light and refreshing does that sound on a hot Summer day? Perfect! I brought you an easy chocolate cupcake with addicting Oreo frosting! Our family has a major sweet tooth. Sometimes there are more desserts on the table than there are main meals. Not only did we celebrate Memorial Day this weekend at the lake, but Jon's birthday is this week so we did a little early celebrating for him too! If you know my husband at all you know the man could live off of Oreo's. Cookies, shakes, pies, ice cream. If it has the word Oreo written across it, he's sold. So in lui of his unhealthy obsession I only saw it fit to make him Oreo cupcakes. And I've learned I do not have the patience for decorating. So please excuse the monstrosity on top I call icing. What is your favorite BBQ, Summertime recipe? If you have never visited Kristal before, I recommend doing so! Blog, Twitter, Pinterest, Instagram, Facebook. Not only is she a terrific mommy and wife with a heart for Jesus, but the girl can cook! Seriously, I stalk her blog for recipes constantly. There has never been a meal from her blog that Jon didn't approve of, but then again what doesn't he eat? 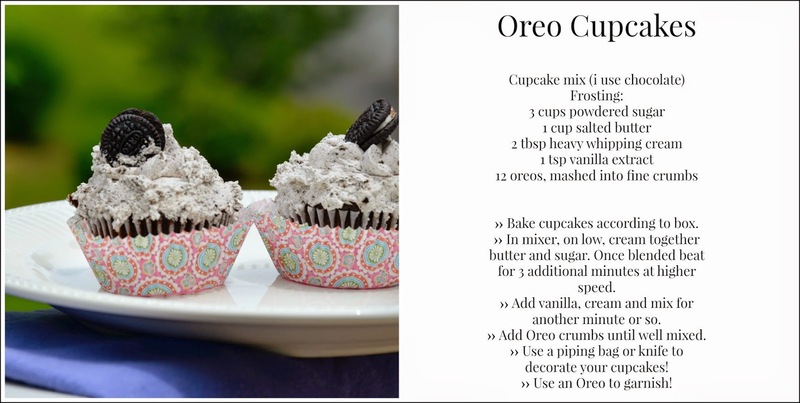 14 comments on "A Taste Of Summer"
Those oreo cupcakes look divine! Those Oreo cupcakes sound amazing!!! Yum!! Yummm! I need to try these both! My thighs, however, do not. Oh, those oreo cupcakes are the cutest!! um ok, i want both of these right now. haha @ tamara lee. my thighs dont need them either, lol. Loved doing this with you and really want those cupcakes now!! There is a special place in my heart (er mouth? stomach?) for all things Oreo, too! I've been thinking Oreo cupcakes would be perfect so these just might have to happen after work tonight!